~”Kalpana”, owned by N. Rajkumar, Surrey 21st c.
Recommendation: No action required. Would be nice to study her before Cohen has a chance, but Master is more likely to pursue researchers within Europe than here. MASTER?! Wait, back up! 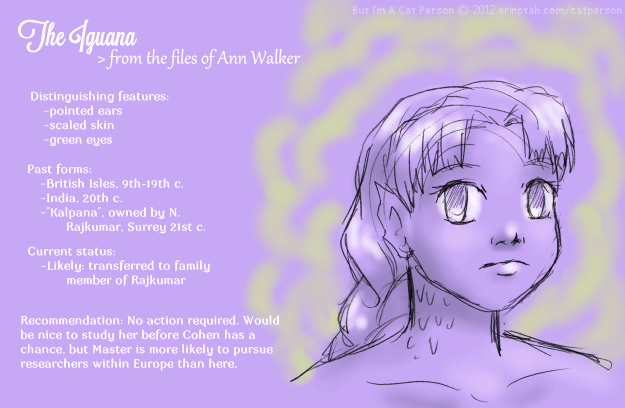 These are from the files of Ann Walker, but there’s mention of a Master? So is someone controlling Walker or is this a being doing the talking? So… was she the inspiration for Grendel, Loch Ness Monster or both?